User Signup – In this section user can register himself. After successful signup, he/she can signin into the system. 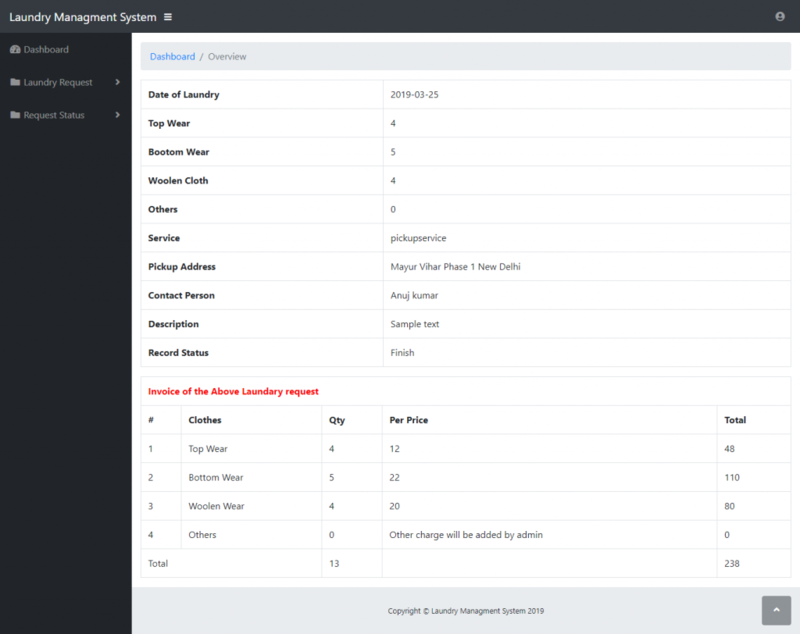 Dashboard: In this section, the user can view the status of his laundry request and price of the laundry. Laundry Request: In this section, user can sent the laundry request by filling the laundry detail form. Request Status: In this section, user can check his/her laundry request status which is done by admin(means his/her request is at what step). A user can also update his/ her profile, change the password and recover the password. Dashboard: In this section, admin can see laundry request of all user(means how many are a new request, accept the request, in-process request and finish request) in brief. Reg Users: In this section, admin can view user detail and update user detail. Laundry Request: In this section, admin can see the detail of the laundry request and also change the stage of the laundry request. Reports: In this section, admin can see the laundry request according to dates and admin can also count request on the basis of month and year. Notification: In this section, admin gets the notification if any user request for laundry.